Reachers > Golden Retriever Reacher Buy 2 -- Just in case! The Golden Retriever Reacher grabber is no longer being made, but the Medline Reacher Grabber is virtually the same device. So don't despair if you are looking for the Golden Retriever reacher, you can still get the Medline reacher and it's the same functionality. One thing I really liked about the Golden Retriever reacher when it was available from the original designer is that they sent me a replacement part at no charge, not even shipping cost! Oh well. 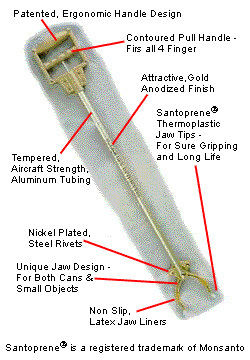 But at least you can find a substitute reacher grabber like the medline one or look for another one down below. Also you can explore other types of reachers besides the Golden Retriever reacher using the left menu. As you can see, the reacher on the left is very similar to the golden retriever reacher which is no longer available for purchase. The grips and jaws are almost identical. 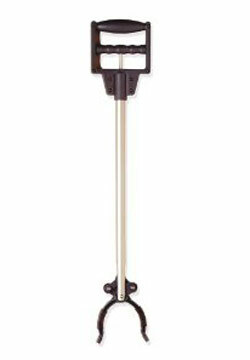 You can buy the replacement for the goldren retriever reacher here.